A new reports claims that former Secretary of Defense Donald Rumsfeld quoted the bible liberally in war memos to President Bush. Donald Rumsfeld quoted scripture like a fire and brimstone preacher while advising President Bush on the Iraq war, according to a new report that suggests the former defense secretary salted his memos with gospel talk to manipulate his boss. Ex-administration officials told GQ magazine about Rumsfeld's approach, even sharing report cover sheets that illustrated his holy roller tack. The cover of an April 10, 2003 Pentagon memo prepared for the president showed the statue of Saddam Hussein being toppled and scenes of grateful Iraqis. Below the images were the words: "Behold, the eye of the Lord is on those who fear Him ... To deliver their souls from death." The cover of another memo featured the words, "Whom shall I send, and who will go for us?" above a soldier who appeared to be bowing in prayer. Below, were the words, "Here I am Lord, send me!" Isaiah 6:8. The article asserts that such wording became routine as Rumsfeld's Pentagon briefed and advised the deeply religious Bush on the war effort. The cover sheets and their Biblical musings were crafted by Major General Glen Shaffer, a director for intelligence who reported to Rumsfeld. When staffers complained to Shaffer that the covers were offensive and could prove damaging if leaked, Shaffer told them his superiors, including Rumsfeld, appreciated them, according to the article. One staffer kept copies of the report cover sheets and turned them over to GQ write Robert Draper. Many staffers Draper interviewed remain loyal to Bush, but say Rumsfeld was largely responsible for casting the administration in a bad light during the war and even the response to Hurricane Katrina. The article charges that Rumsfeld fought against troop increases and even allowed his personal arrogance to inconvenience soldiers. When the king of Jordan insisted that U.S. war planes that had flown over Israel could not cross his country, an aide to then-National Security Adviser Condoleezza Rice said Rice was prepared to speak to the king. "When I need your help, I'll ask," Rumsfeld reportedly replied, leaving military fliers to go the extra distance. Finally, the article claims that Rumsfeld seemed to have particular difficulty treating high-ranking women with respect. While Fran Townsend was No. 3 in the National Security Council, Rumsfeld's contempt for her was well-known. When she was later promoted to assistant to the president for homeland security and counterterrorism, Townsend tried to reach Rumsfeld amid Hurricane Rita. Rumsfeld refused to take her calls, with White House Chief of Staff Andy Card finally calling her back. "Rumsfeld just called," Card reportedly said. "What is it you need?" 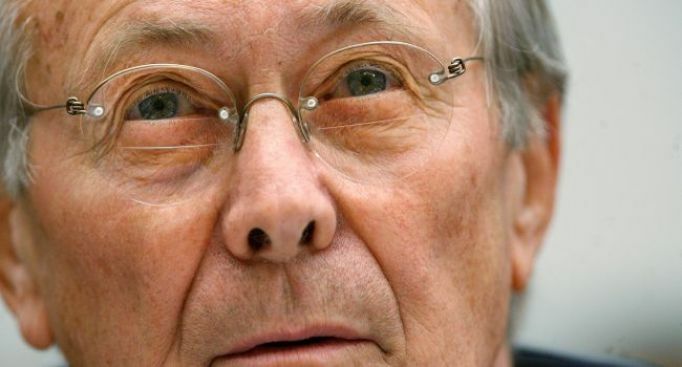 "I need to know if the president knows what a f---ing a--hole Don Rumsfeld is," an angry Townsend replied. Card sighed, according to the article, and answered: "It isn't you, Fran. He treats Condi the same way. Me, too. He's always telling me I'm the worst chief of staff ever."